How is the United Kingdom? (Scotland, London & Cornwall edition) – Travel. Live. Eat. The United Kingdom, the country that consists of places like England, Scotland, and Wales who just love their independence so much that they want become their own countries. Beside that the UK is also known for their fish & chips, rain and British accent that can confuse the rest of the world! We’re writing about our experience on the trip around the UK including Scotland, London and Cornwall (these spots are highly popular amongst both tourists and travellers, especially in the summer). There are countless of things to know… so let’s see what the UK is like! If you think Vancouver and South East Asia rain a lot, you have seen nothing yet! UK is known for their year round rain which means the humidity is really high (mostly more than 65%). Even during the summer time (June or July – October), the weather still has no mercy for travellers nor does it have for the british citizens. This is what we’ve discovered from travelling around the UK… the rain gets heavier in the north during summer and it’s the opposite for the rest of the year; however, the weather remains colder in the north. We noticed when we were in Scotland, it was cold as if it was autumn and rainy seasons instead of summer. London and Bristol were mild, it rained but the weather was warmer than Scotland (yes it was warmer, but that doesn’t mean there was no cold air!). On the other hand, Cornwall was SO HOT and it barely rained. The sun was strong enough to make couple of our friends burn from 2 hours of sun bathing! So the weather of the whole country is like a temperature gradient. To sum it up, go to Cornwall in the summer and go up north to Scotland in the winter! You would think summer means warm beaches… no you’re really getting that in the UK. 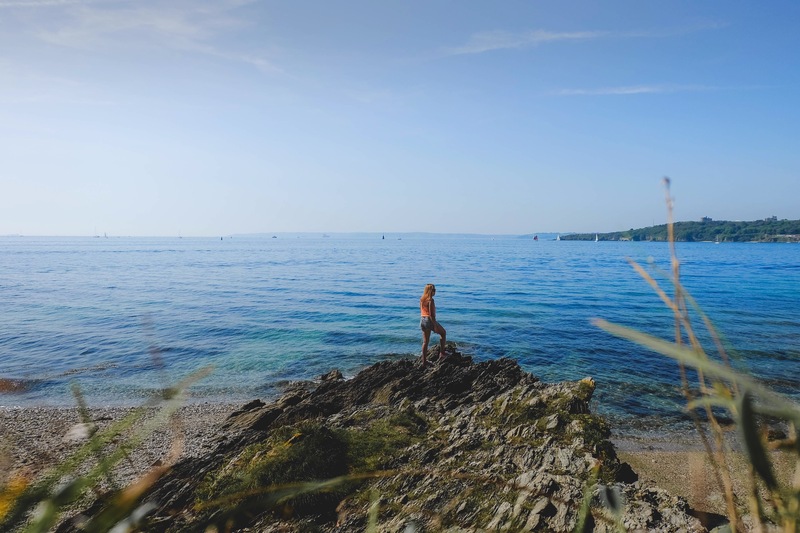 We went to beaches in Cornwall and the water was FREEZING COLD… not going to lie once your body gets used to the temperature it’s quite refreshing and the water in Cornwall is so blue and clear! It’s definitely a great way to cool yourself after a sun bathe… and don’t worry you won’t get a hypothermia because the weather is a lot warmer than the water. One thing that was more disappointing than anything was the food up in London and Scotland. They’ve got really really bland taste; London is a lot worse, Scotland at least has got more flavours. Most things in London are overly sweet, we went to 3 different Indian restaurants and one Chinese… and oh my god all of their food was so sweet! When we travelled around Scotland, we were so relieved because the food actually had more flavour and it wasn’t making us diabetic. Their national dish (Haggis, neeps & tatties) was really good; it consists of sheep’s organs, mash potatoes and mash vegetables… apologize for all vegetarians and vegans out there, this one might not be suitable for you. On the other hand, I swear to god that nearly every places in Cornwall make heavenly food. They really do, my mates and I went out couple times and we weren’t disappoint with the meals at all! So pretty much Cornwall is the perfect summer spot in the UK! Scotland has haggis, London has fish & chips, and Cornwall has got pasties! Try the steak pasties or vegetable ones, they’re like so so delicious! 4. What is up with the alcohol?? It’s insane how essential alcohol is over here. Literally you go to a restaurant, you have to order alcohol. You go on a picnic or do a barbecue, mates bring alcohol. And when you go to Scotland, there’s a lot more alcohol! They’re everywhere! It’s an important thing to keep the social life… have got nothing to do but want to get together with friends, let’s just go grab some drinks at a nearby pub. And it’s worse in Scotland because the amount that they drink is insane! Of course if alcohol is this important it means that they sell it everywhere and you can drink it anywhere legally. They sell lots at Tesco and other grocery stores, convenient stores, restaurants, pubs and clubs. You can drink at a park, beach, school, on the street, or pretty much everywhere… even on the train (yes, we saw a lot of people drinking on the train). This is the weirdest thing because in most countries, trains eat up a lot less money than any other kinds of public transports… but it’s the opposite in the UK. For instance, a train ride from London to Glasgow can cost up to £182.5 while it costs £107 by plane. And to get to Bristol, the train would charge you £60 for a return ticket, Megabus would ask you to pay £15 for both ways between London and Bristol. The difference is insane and it’s a pain for small budget travellers or anybody who doesn’t feel like spending a fortune on public transports. It’s so weird and confusing because Scotland is in the UK but they’ve got their own bank notes?? Another weird thing is that the normal pound notes can be used in Scotland but the notes from Scotland can’t be used in the rest of the UK… how confusing is that! Even Scottish people themselves are confused and still don’t understand that is the reason. In terms of coin, don’t worry the whole country is all on the same page this time.